The Monkey King Bar is raised. And we thought yesterday’s Underlord reveal was the end of it. At the end of play the International today, fans were asked to stick around for ‘a presentation’. That presentation turned out to be an incredible martial arts performance accompanied by Taiko drums, at the end of which Valve revealed a new hero: Monkey King. Sun Wukong was teased many years ago in the original DotA, and a recent Dota 2 test update included a mysterious prevalence of bananas: all signs pointing towards the first hero to be added to Dota 2 that isn’t a port from the original mod. 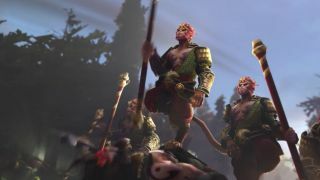 Monkey King will arrive in Dota 2 in the fall, as part of ‘The New Journey’ update—an appropriate name given the Monkey King’s origins in Journey to the West, as well as the new direction this represents for the game as a whole. Monkey King’s abilities and role haven’t been fully revealed yet, but the trailer gives a hint: he’s a martial artist with illusion powers and what looks like the ability to disguise himself as a tree. Think Phantom Lancer by way of Treant Protector and… well, you won’t get very far. Needless to say, it’s an exciting time to be a fan of the game. The International 2016 concludes tomorrow as the remaining teams compete for the lion’s share of a stagging $20m+ prize pool. Don’t miss it, and be sure to check out our International write-ups to get up to speed on the action so far.